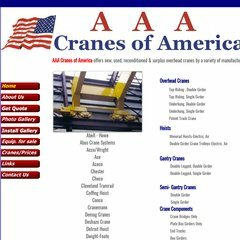 aaacranes.com AAA Used Overhead Cranes of America - AAA Used Refurbished ..
aaacranes.com Reconditioned Cranes Hoist - AAA Used Refurbished Remanufactured ..
Its 2 nameservers are ns58.1and1.com, and ns57.1and1.com. 1 1 Internet Inc. Pennsylvania is the location of the Apache server. Its IP Number is 74.208.58.59. PING www. (74.208.58.59) 56(84) bytes of data. A ping to the server is timed at 0.868 ms.